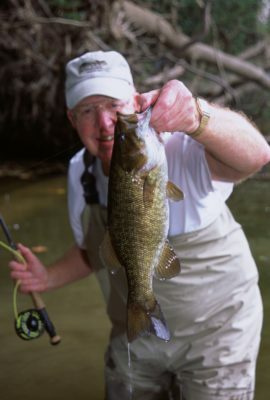 Fall is my favorite time to fish the Shenandoah River because I catch lots of large smallmouth bass. The sections of the North Fork of the Shenandoah River that most anglers favor is from New Market downstream to Strasburg. However, a very productive section of the South Fork of the Shenandoah River that receives less pressure is from Luray downstream to the Andy Guest Park. Many of the public access points in these areas area are highlighted in my book Virginia Blue River Streams. Aquatic grassbeds are my favorite places to fish for smallmouth bass. From the time they form in the middle of the summer until fall, I go out of my way to devote a great amount of time to these areas because they provide an abundance of food and cover for the bass. I like to fish these grassbeds from the downstream side of the ledges by wading or floating depending on the depth of the river. They seldom let me down in the number and size of the bass I catch. My five favorite flies for smallmouth bass in the fall are the Murray’s Magnum Hog Sucker, Murray’s Magnum Bluegill, Shenk’s White Streamer, Shenandoah Blue Popper, and Murray’s Heavy Black Hellgrammite all in size #4. 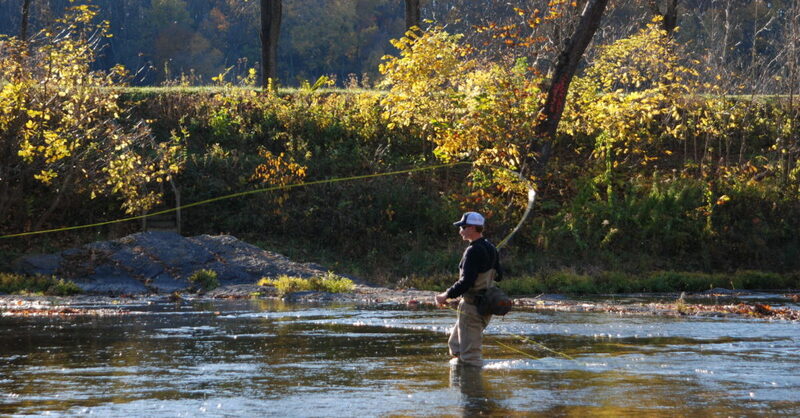 Nine foot seven weight fly rod is ideal for the Shenandoah River. If you are new to fishing the area, I have four super fishing guides that will be glad to offer valuable hands-on instructions. If you are looking to expand your angling skills, consider attend one of the many fishing schools taught each year. Last but not least, don’t miss “catching” my weekly stream reports before heading to the Shenandoah River or area trout streams. I cover up to date stream conditions, what’s biting, and recommended flies. At the first of each month I send out a free monthly newsletter discussing the best tactics and flies for the month. Anglers can sign up at www.murraysflyshop.com.